Shane Wolf '08 (above) and Bryan Gardner '09 have been selected in the MLB Amateur Draft. Two members of Ithaca College’s baseball team were picked in the Major League Baseball Amateur draft. Shane Wolf '08 and Bryan Gardner ’09 were drafted by the Houston Astros and the Cincinnati Reds, respectively. They’re the first Bombers to be drafted since Cameron Smith was picked by the San Diego Padres in 1996. Both of the players received recognition while playing for the Bombers. 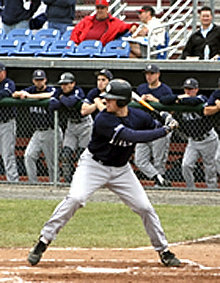 Wolf was named first-team all-American by d3baseball.com, and he earned second-team, academic, all-American honors. He was a two-time pick to the American Baseball Coaches Association (ABCA) all-region team as a Bomber, earning third-team recognition as a utility player last spring and first-team accolades as a pitcher this season. He was also a first-team Empire 8 all-star, twice, at two positions, earning honors as a pitcher and designated hitter in 2007 and as a pitcher and first baseman in 2008. Wolf will be playing a short season with the Valley Cats in Albany this summer. Gardner, a first-team Empire 8 all-star and a second-team all-region pick, was the first reliever to be named Empire 8 Pitcher of the Year, and his eight career saves are fourth on the program’s all-time list. Gardner has not yet completed his senior year, and if he signs with the Reds he’ll lose eligibility as a college athlete. “I will probably forgo my senior season and try to have a successful career in baseball,” says Gardner. “I plan on finishing school either during or after my baseball career…This has been a dream come true for me." "I knew the potential was there," says IC baseball coach George Valesente. "Both were hardworking and dedicated young men, they applied themselves physically and mentally to achieve their goals."